The web users have been growing at a tremendous pace globally, and smartphone users have a substantial contribution in such increased growth. Today, a number of web users also prefer going to digital classified portals for their individual and business needs, making this segment quite lucrative among the entrepreneurs. We have been providing hi-tech web solutions for the classified industry so that product/service listing can boost commercial exchanges worldwide. WeblinkIndia.Net specializes in undertaking Classifieds Web Development to provide a successful working platform for various business needs. For Classifieds Web Designing, we use the latest software and development platforms such as PHP, Java, MySQL, Joomla and Drupal to name a few. For Classifieds Web Designing, we use the latest software as well as development platforms such as PHP, Java, MySQL, Joomla, Drupal, etc. Keeping in mind high revenue generation, we develop the perfect place for many small and large companies to get visibility and for the customers to search from a highly organized directory. From Simplified ad posting to Featured ads, Custom ad fields, and others; we incorporate all vital features that differentiate your classified website from your competitor’s. With WeblinkIndia, you get classified websites that showcase different online promotion options for free and premium members. Our team of experts understands your exclusive needs and develops a classified website tailored as per your requirements. NTPL Solutions is a professionally managed firm, involved in providing top-notch solutions to the clients based in Varansi (Uttar Pradesh, India). Since incorporation, we are involved in designing and developing basic amenities & structure of smart class, computer lab, robotic lab, art & craft lab, Google classroom and digischool content. Ours is a team of talented individuals and provide solutions in concern with clients’ fundamental requirements. For more details, visit our official website that is designed by WeblinkIndia.Net Pvt. Ltd.
Clinical Sim is a Saudi Arabia-based organization that is engaged in offering support for clinical simulation and other training resources. Our company is expanding the usage and learning scope of medical simulation. Some of our services include management, operation, training experts, field support, consultations, solutions, and supplies. We mainly deal in medical education, tools, vital sign monitors, anesthesia machines, operating lights, surgical lights, surgical tables, and other such equipment. The website for Clinical Sim is designed, developed, and managed by an India-based organization, named WeblinkIndia.Net Pvt. Ltd.
Salhiya Tower is one of the leading wholesalers and distributors for office supplies and packaging consumables. The company is functional in Kuwait since 1993. It has a track record of serving a large number of buyers across the nation. 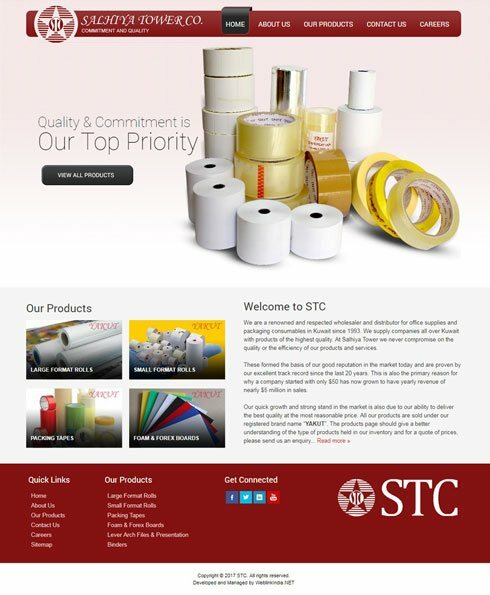 Right from Large & Small Format Rolls, Packing Tapes, Lever Arch Files & Presentation Binders and to Foam & Forex Boards, the company deals in a variety of Packaging Products. WeblinkIndia.Net has done Dynamic Web Designing and Web Hosting for Salhiya Tower. WeblinkIndia.Net excels in PHP Web Development as well. Based in Kuwait, Kokonano is a renowned name in the online marketplace of Arab region, featuring a wide range of products across various categories. Managed by a team of industry experts, we provide attractive offers, safe online payments modes and distinctive customer service. We trade watches, perfumes, electronics, cameras, music, toys, food supplements and all the trendy items under one roof. So, login to our portal and acquire products at the best price. The detailed website of our company is designed and managed by an India-based company, WeblinkIndia.Net Pvt. Ltd. Choose WeblinkIndia For Classified Website Development – Here’s Why?